Located in the heart of Sukhumvit, Citadines Sukhumvit 11 Bangkok is perfect for travellers looking for a place that are near to most tourist attractions and also provides for a range of entertainment and dining options. 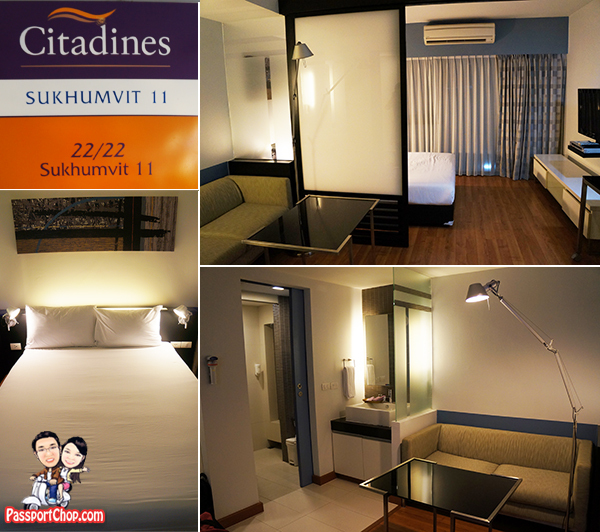 During our weekend getaway trip to Bangkok,we stayed in the small but cozy Studio Executive room at Citadines Sukhumvit 11 Bangkok. 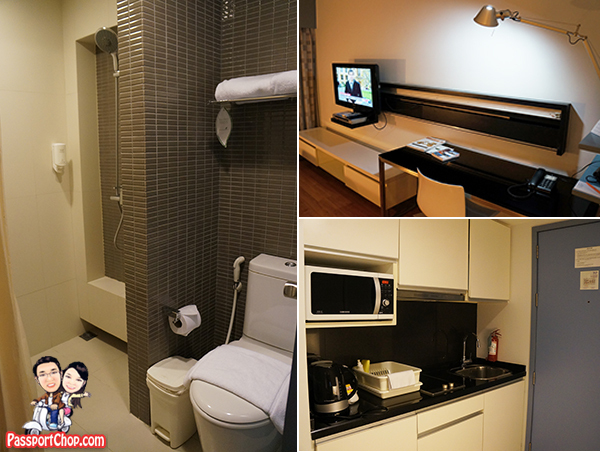 Despite the room size of just 30sqm, we had a separate bedroom, living and kitchen area. The home entertainment system includes a sleek cable television that slides from the living area to the bedroom to create a comfortable living environment. We don’t feel cramped at all due to the excellent room area planning which created ample space for us to pack our luggages with our daily shopping loot. The room is fully furnished with modern and stylish fittings and it is designed to allow guests to relax, live, work and entertain in comfort. In-room facilities include telephone with IDD facility and complimentary basic Wi-Fi internet access is included. The Wi-Fi is pretty slow though (they did say it is basic – just for checking emails and some facebook surfing – not for heavy duty stuff like streaming TV shows – if you want something with higher speeds, you can always pay to upgrade your plan). The fully equipped kitchen has a cooker hob and hood, microwave, refrigerator, and glassware, crockery, cutlery and utensils – perfect if you had a long day out and just want to relax with some simple home-cooked meals or instant microwaveable food from nearby 7-eleven or even just instant noodles! Also provided are the bedroom linens, bathroom towels and toiletries. Wireless internet access is also available throughout the building including all common areas and in the business corner. You can even relax in the outdoor pool and a good workout in the fitness corner. Citadines Sukhumvit 11 Bangkok is walking distance to Pacific Place, Phloen Chit Centre and Times Square, shopping at the local and expatriate favourite – Villa Market and a vast array of trendy restaurants, pubs and nightclubs like the Bed Supper Club, Zanzibar and Q-Bar. 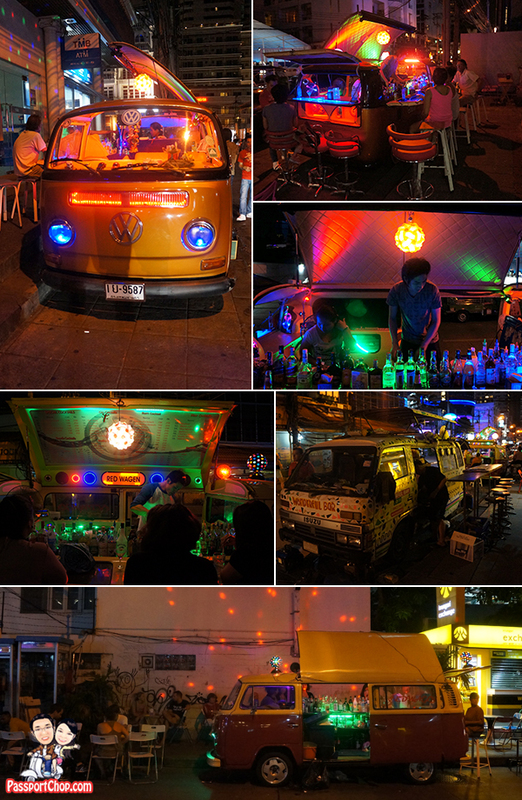 We arrived at around midnight and the nightlife was actually just starting around the Citadines Sukhumvit 11 Bangkok with mobile Volkswagen van-bars along the road to Citadines. Don’t worry about the nightlife noise – the rooms are well-insulated from it with soundproof windows. The Volkswagen van-bars are worth checking out – see how they transformed from normal vans into one fully equipped with glasses, beer, wines and whatever you need for a pre-clubbing drink or a post-clubbing night cap. Yes these happening van-bars are just one part of the whole nightlife equation around the area! The real happening stuff are at Bed Supper Club for those into clubbing and dancing the night away or the nearby Manchester United pub for those keen to catch some live Manchester United games (just wear the right jersey into the pub – not one of the rival derby clubs!). If you just want to grab a night-cap or a supper, you can also just head downstairs to Mulligan’s Irish Pub and Restaurant where you could also catch a live soccer match and drink beer and make some new friends! This pub is open 24 hours so if you can’t sleep, check it out – after all the slogan of Mulligan’s Irish Bar and Restaurant is “Ceol, Caint Agus Craic” In Irish, this saying roughly means “music, conversation, and fun” and you can be sure you will get some of these at Mulligan’s in Citadines Sukhumvit 11 Bangkok. In addition to the Asian beers – Chang, Singha and Western beers – Carlsberg, Fosters and Guinness, the bar also has Ohara’s Pale Ale, Magners and Black Irish (Guinness & Jameson) all on tap at 120-280 Baht/pint and 80-140 Baht/half pint. The signature dish of Mulligan’s include the classic fish n’ chips (340 Baht) and snacks such as salt n’ pepper calamari (200 Baht). The serving are very generous and the food is great! After a long night of chiong-ing (which means clubbing in Singlish), there is no better way to get over a hangover with a great breakfast (as long as you can wake up before 11am) at Mulligan’s Irish Pub and Restaurant – Yes – the same place which served an awesome plate of Fish and Chips and great beer! 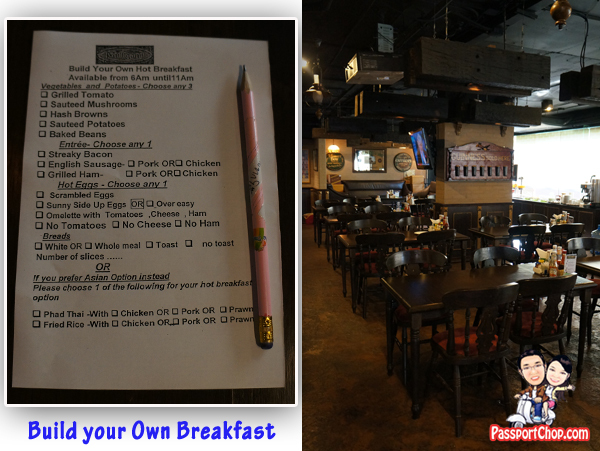 Mulligan’s Irish Pub and Restaurant offers a Build your Own Hot Breakfast service where you had to select from the” menu” the things you want to include in your Western or Asian breakfast. The breakfast at Mulligan’s Irish Pub and Restaurant cost 200 Baht (slightly less than 10 singapore dollars) – while it is on the high side considering that you can get cheaper food elsewhere in Bangkok but you get really good quality and tasty food in the comfortable setting of the pub. The Western option is slightly more complicated with its selection of eggs, sausages, bacon and bread but it is all about the eggs – Scrambled style or Omelette style – both are just super yummy and tasty. Even if you are not staying at Citadines Sukhumvit 11 Bangkok but happen to be in the area, just walk in for its breakfast (before 11am) and you won’t regret it – we didn’t! There is also a buffet counter with just cornflakes and fruits and milk and fruit juices as well as tea – feel free to help yourselves to those too. The BTS Nana Skytrain station is minutes from the residence with Citadines Sukhumvit 11 Bangkok complimentary tuk-tuk service. The tuk-tuk is clean and spacious unlike the tuk-tuks you see on the street – if you want a tuk-tuk experience without the need to haggle and bargain for a fare and still take a comfortable ride down Bangkok’s street – this is the closest you can get to it! The tuk-tuk will stop at Terminal 21 shopping centre – from there, its just a short walk to BTS Nana Skytrain station or Sukhumvit MRT (the signs are clearly marked so just follow them or ask around). If you want a return trip by the Citadines tuk-tuk, simply call Citadines (get the Citadines namecard from the reception) using your mobile (if you have the local SIM card) or use public phones at Terminal 21 shopping centre. Thanks for sharing superb informations. Your site is so cool. I’m impressed by the details that you have on this site. It reveals how nicely you understand this subject. Bookmarked this web page, will come back for more articles. You, my pal, ROCK! I found just the info I already searched everywhere and just could not come across. What a perfect site. great post, I am interested in this. Hi! I am a tourist from India. Love your posts, so informative! Will be in Bangkok soon, cant decide between Citadines Soi 11 or Hotel Grand President Soi 11, cost is almost same but Grand President has buffet breakfast included. Which one do you suggest? Are the rooms and bathroom in Citadines nice? Please recommend. Thanks. All rooms in Citadines come equipped with a fully furnished kitchenette (great if you are thinking of doing self-catering instead of eating out); the rooms are adequate, functional and simple (don’t expect elaborate decorations). The breakfast, while not buffet, was excellent and very tasty and the servings were adequate. 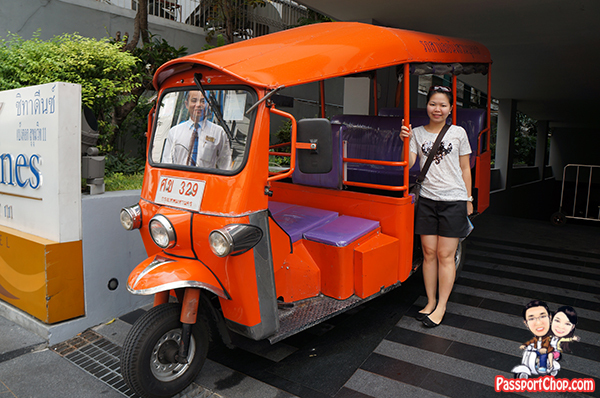 Citadines also provided free tuk-tuk transfers to the nearby MRT/BTS station and Terminal 21. There is a very happening and active pub downstairs as well as a number of clubs e.g. Supperclub nearby and the road just outside the hotel is also a very clean and active night scene (so if you are into the Bangkok nightlife, Citadines is a good base to start from). I really appreciate the effort you put into reviewing the hotel. It is really helpful and I will seriously consider staying at this hotel the next time I am there. I was researching on the cost of this hotel and saw from this hotel comparison website Trivago.sg; that the breakfast cost an addition of $20. Is it really worth paying $20 for this breakfast? 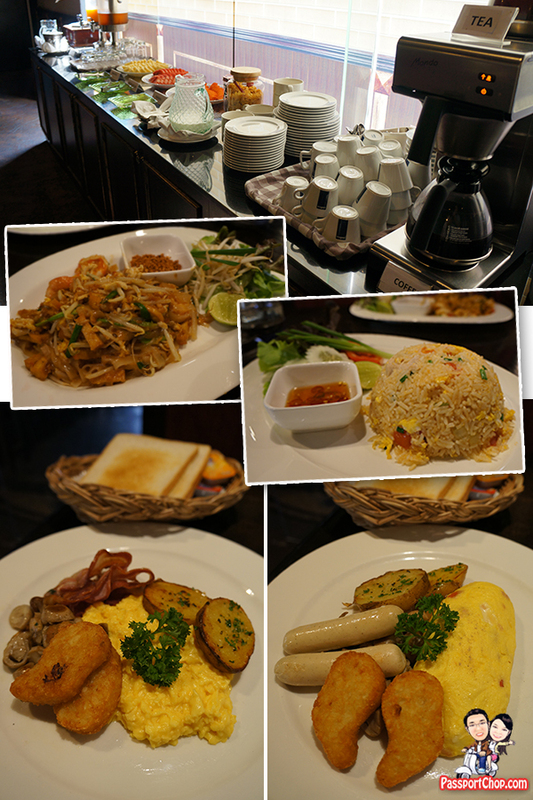 Hi LT – it shouldnt cost more than 10 SGD (about 200 Baht) for breakfast at Citadines Sukhumvit 11 Mulligans. If the hotel comparison site shows the cost at 20 SGD then don’t book it there. You can order direct from the restaurant when you check-in.